Published on 10 July 2012. 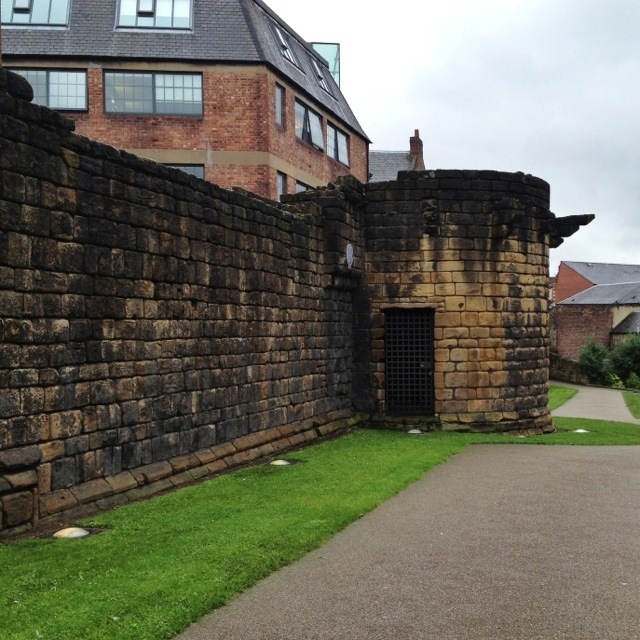 This is a bit of Newcastle’s ancient town wall – specifically, the Durham Tower bit. The wall was built in the 13th and 14th centuries, and was once 2 miles long, 2m thick, and over 7m high. There were 17 towers like this one, all within shooting distance of each other to repel attackers. The construction of the wall was funded through a special tax – a murage – which was levied for a hundred years. The wall kept the town reasonably well protected from invaders, seeing off attacks from David II of Scotland and the Earl of Douglas among others. By the 18th century, the wall had fallen into disrepair, and Scottish armies were able to invade Newcastle a couple of times. By the late 18th century bits of it started to be knocked down, because it started to get in the way. These days, it’s a scheduled ancient monument which is also the home to a notable literary landmark: Morden Tower, where many great 20th century poets came – and still come – to read their work. Allen Ginsberg, Ted Hughes, Basil Bunting, and Seamus Heaney are just four of the hundreds of previous poetic visitors! It’s also the place where the band Whitehouse once gave a performance in which the entire audience walked out. I don’t think that’s ever happened to any of the poets! This 1,718th post was filed under: Photo-a-day 2012, Architecture, Newcastle-upon-Tyne.